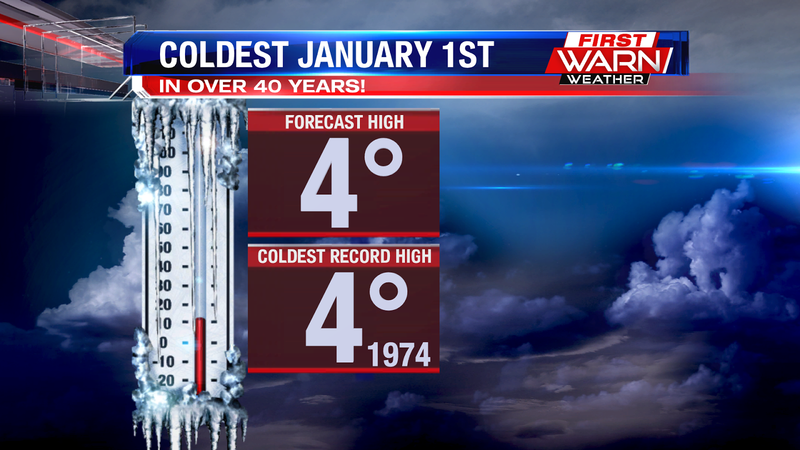 Coldest Start to the New Year in Over 40 years! The start to 2018 could be a record start. Record cold, that is. 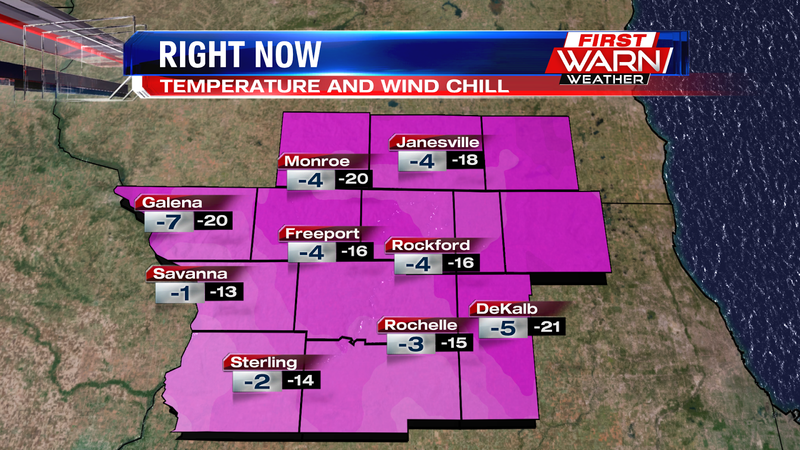 The coldest high temperature recorded on January 1st in Rockford was a whopping 4 degrees, set back in 1974. The current forecast high for January 1st, 2018 is 4 degrees. 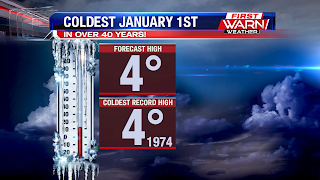 If temperatures fail to make it above 4 degrees Monday, it'll be the coldest start to the new year in 44 years! That's pretty impressive. Temperatures will struggle to warm for roughly the first week of January, but a pattern change could bring temperatures back up near average (mid 20's) by next weekend. A Wind Chill Warning will go into effect at 9pm Sunday evening for most of northern Illinois, with a Wind Chill Advisory going into effect at 8pm for southern Wisconsin. Despite the sunshine Sunday afternoon, temperatures failed to make it much above 10 degrees. 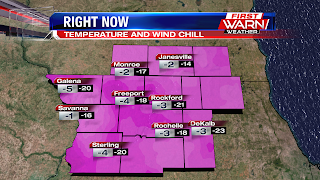 Now with the sun quickly setting, temperatures are quickly falling and will be down below zero for most by 7pm. Winds Sunday evening and night won't be overly strong, but there will be just enough of a breeze to cause wind chill temperatures to drop as low as 25 degrees below zero! Frostbite can happen within a matter 15 to 20 minutes to exposed skin. 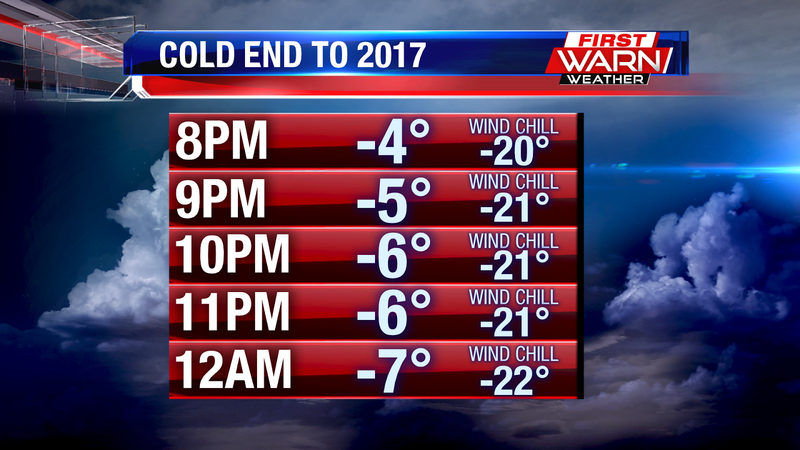 So for those planning on celebrating the New Year this evening, please take the cold seriously. Dress in layers and try to limit any prolonged skin exposure to the cold. 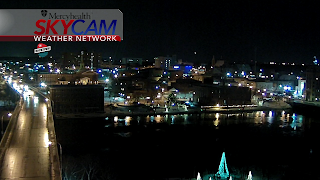 It's a nice, clear evening out in the Stateline, but sadly those clear skies are only going to allow those temperatures to drop even more as we head through the night. Highs were only 2° this afternoon in Rockford, and those are the kind of highs that we can expect for our area for the next several days. We're already in the negatives, these temperatures being reported at 6pm, and they're only going to get colder as we head into the night. 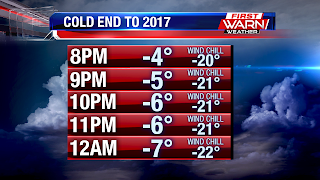 We dip to around -8° for our lows tonight, with wind chills around -20° during the overnight. 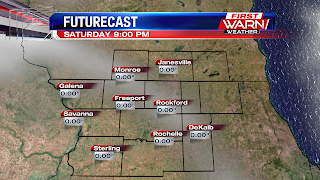 The only relieving factor is the cloud cover that'll move in, which will keep those temperatures from cooling below -10°. As we head through the evening we'll start to see some clouds move in after 8pm, which will continue building as we head into the late-night hours. 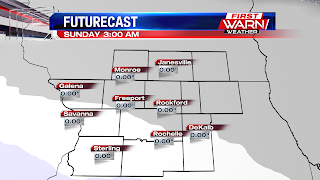 A weak, mid-level low will move into our area after midnight, bringing us chances for flurries during the overnight, but any light snow that forms will end up staying west of the Stateline area as our atmosphere is fairly dry. Chance for flurries will stay with us through Sunday morning, but then we'll see the cloud cover decrease for the afternoon, allowing for some sun. The reason we've been seeing such cold temperatures is because of the Polar Vortex. Usually, it's fairly strong and keeps itself together up in the Arctic, which in turn keeps any cold spells short-lived since it's harder for us to get access to the arctic air in that scenario. 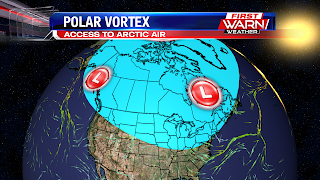 However, this winter, the Polar Vortex is weaker. This means it cannot keep itself together, and ends up spreading away from the Arctic down near the mid latitudes. 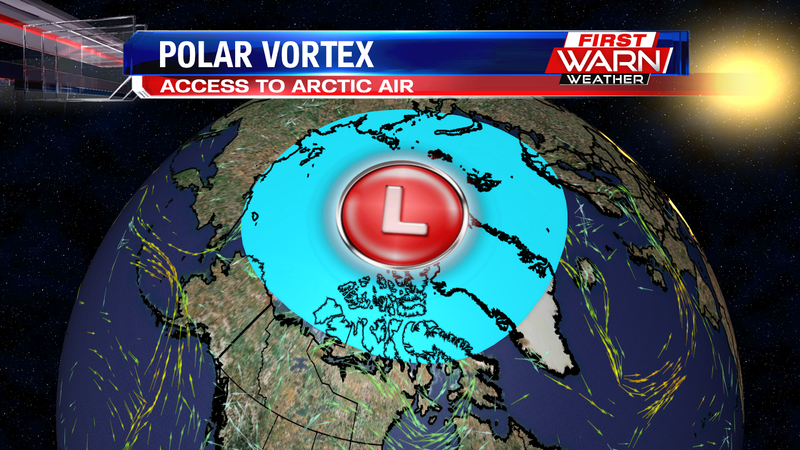 This gives us easier access to the polar air, and allows cold spells to last longer. This is the pattern we've been experiencing the last several days, and is why this cold spell has lasted so long. Also, when you factor in the placement of this high pressure system, that only allows more arctic air to push into our area. This will be occurring for the next several days, but luckily the atmosphere always finds a way to make up for what it's lost. In this case, it's warmth. As we head towards the end of the week, our jet stream will become oriented in such a way that allows for warm air to start moving back into our area. At this point, this looks to occur on Saturday, and if the jet stream can hold its placement around that time, we could be looking at highs near 20° by the start of next weekend. It looks like we'll be ending 2017 in a Winter Wonderland. Snow fell across the Stateline the entire day, allowing for the accumulation to build up pretty quickly. Luckily the more intense snow showers are out of our area, and we'll just be left with some isolated, lighter snowfall as we head through the overnight. 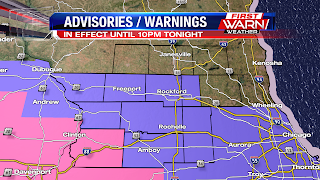 Winter Weather Advisories are still in place across the Stateline, with a Winter Storm Warning down in Whiteside county. 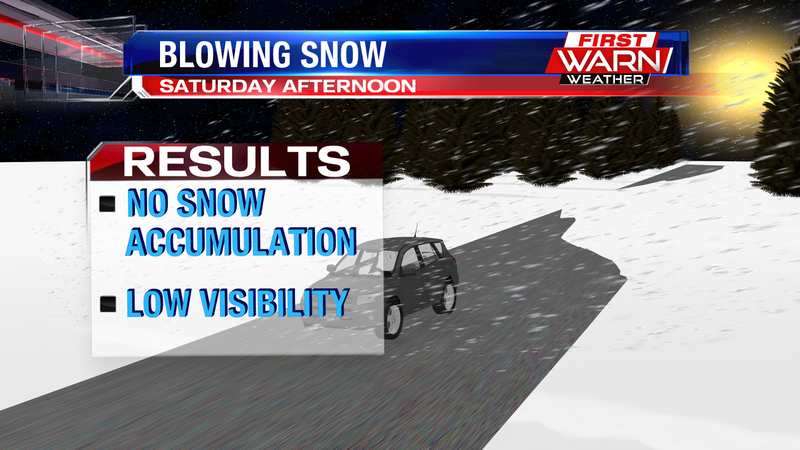 These will all be in effect until 10pm tonight, and by that point we'll be seeing the isolated, lighter snow. As we go through the rest of the night we'll start to see the light snowfall die down to flurries after midnight, with dry conditions settling in around 6am Saturday morning. Accumulations look to be anywhere from 2-2.5 inches across the stateline, with Whiteside county possibly seeing up to 3 inches. Even though the snow will be gone by then, we're looking to get some blowing snow during the day tomorrow as gusty winds will move in from the northwest. Blowing Snow occurs when you have strong winds that move in after snow has already fallen. The winds cause the snow on the ground to fly up into the air, making it look like it's actually snowing when it's actually not. This can lower visibility in some spots, so do be cautious when out driving tomorrow as you may encounter blowing snow while on the roads. Not only do we have messy roads to deal with from the snow, but the very cold temperatures that we're going to continue to see can also impact your driving as well. 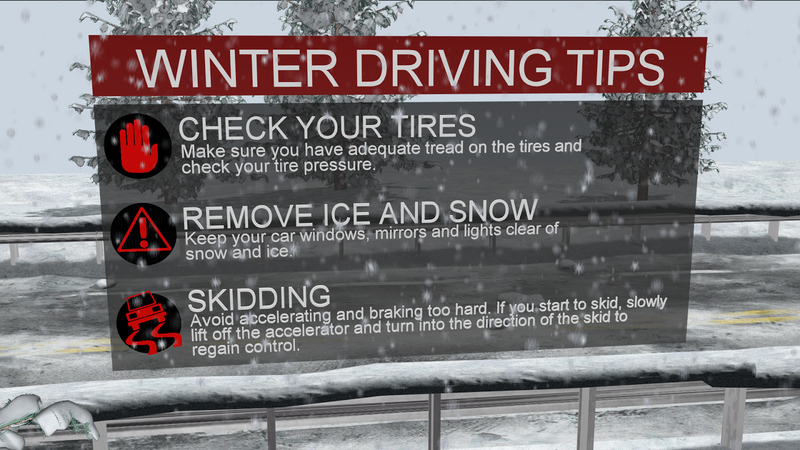 Tire pressure goes down more quickly in cold conditions, so be sure to keep an extra eye on the tire pressure for the next several days. Take the time to remove the ice and snow from your car, as light reflecting off the snow and ice can make it hard to see while driving, leading to a dangerous situation, so be sure to clean off your car before you drive anywhere. With snowy roads and bitter cold temperatures, ice can easily develop, and this has lead to multiple people skidding the past several days while on the messy roads. 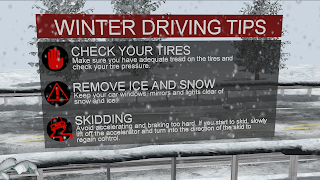 If your car starts to skid, let off the gas and turn in the direction of the skid to regain control of the car. Also, keep in mind that with the ice being able to easily form on the roads in these conditions, that black ice will definitely be a factor. When in doubt, take it slow if you're driving at night in an area that isn't as well lit, because you may very well be driving on black ice and may not realize it. 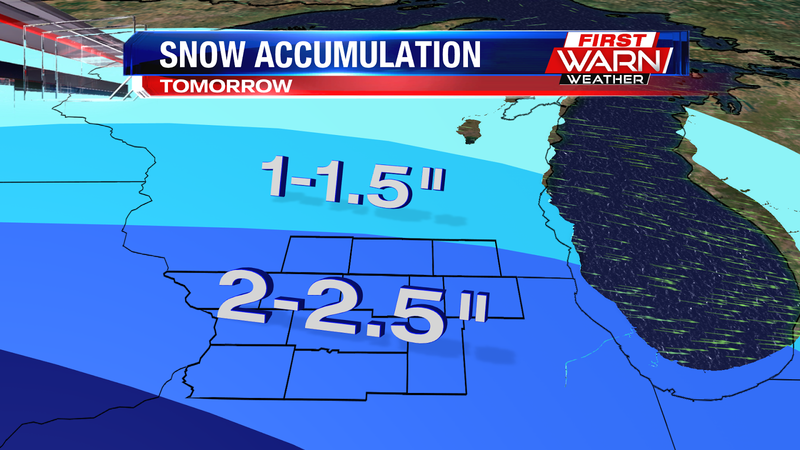 Accumulating Snow and Then Very Cold! Winter Weather Advisories have been posted for much of northern Illinois for today. 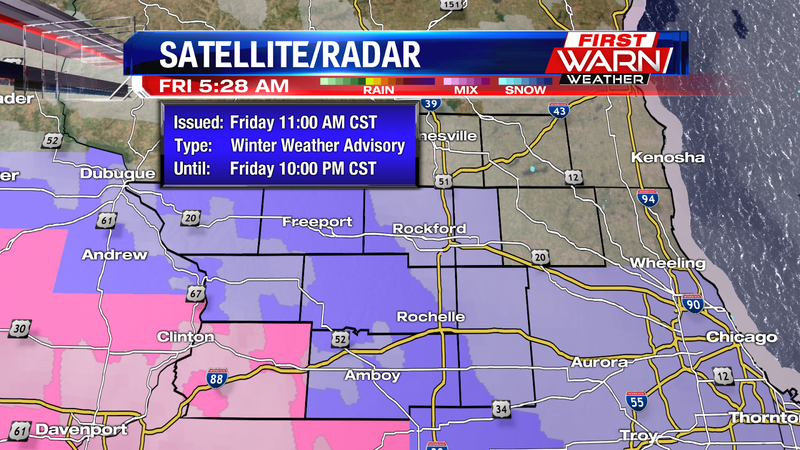 Going into effect at 11am for Jo Daviess, Carroll, and Stephenson counties. The Winter Weather Advisory will go into effect for Winnebago, Boone, Ogle, Lee, and DeKalb county at noon today and lasting through this evening. 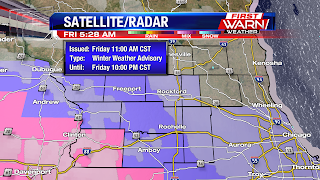 There is also a Winter Storm Warning in place for Whiteside county today, with higher totals expected. 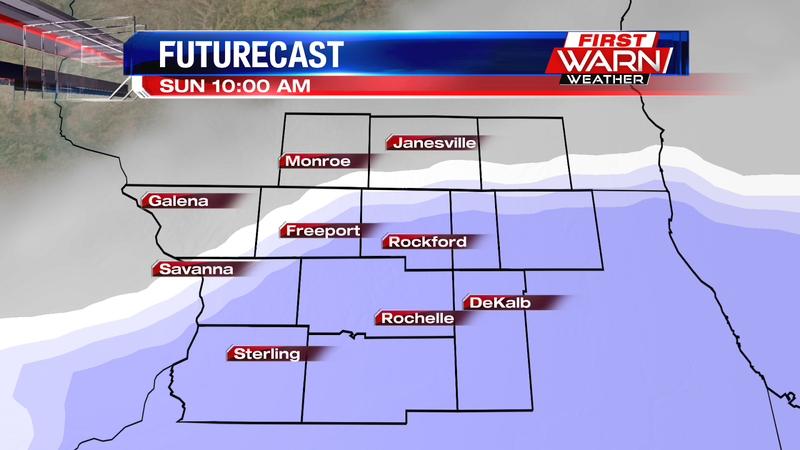 Snow will begin near the Mississippi River around 10am this morning and head east, closer to Rockford around noon and 1pm. This will be a quick hitting system, but also an efficient snow producer. 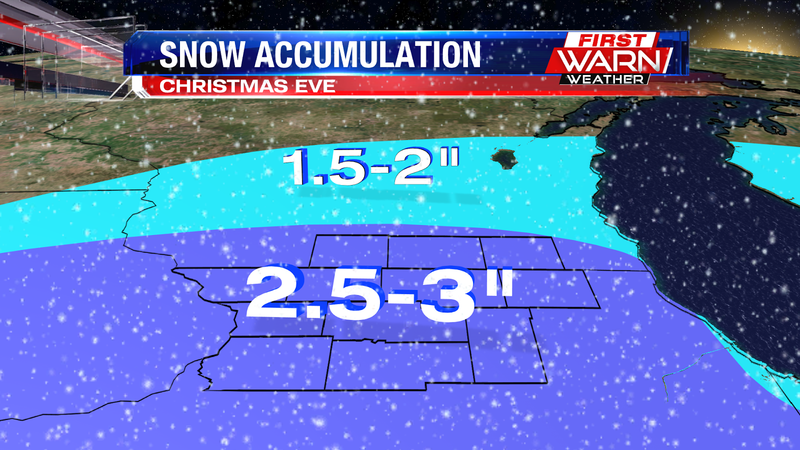 Higher snow totals will be seen just north of the front and incoming energy, and will taper off to the north. The snow will be ending in the evening tonight, between 8pm and midnight. 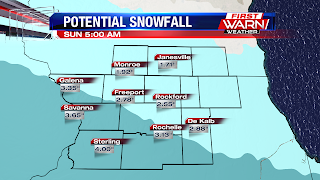 In terms of snow totals, southern Wisconsin can expect about 1-2" of snow, 2-3" near Rockford, and 3-4" south and west of the Rockford area, especially near Sterling. Four plus inches of snow will be possible in the Winter Storm Warning areas, with areas in and near the Quad Cities picking up between 4-6" of snow. 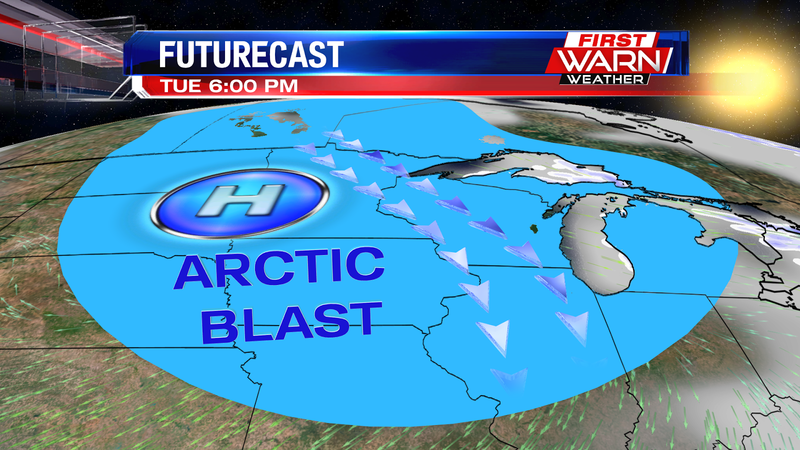 This will be a fluffy snow that will be able to add up with cold surface temperatures. 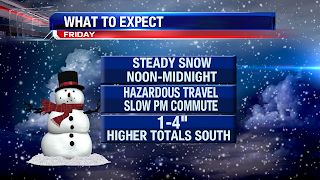 Steady to moderate snow will be falling around the afternoon rush, which will cause difficult driving conditions. With very cold surface air, snow covered roads and slick spots will be likely across the area. 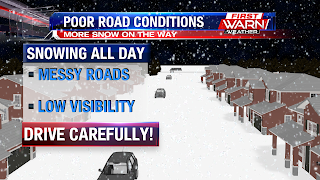 You'll want to be extra careful on the commute home this afternoon and evening with lowered visibility as the snow falls, and slick roads possible. Make sure to flip on your low beams and leave extra travel distances between you and other vehicles. 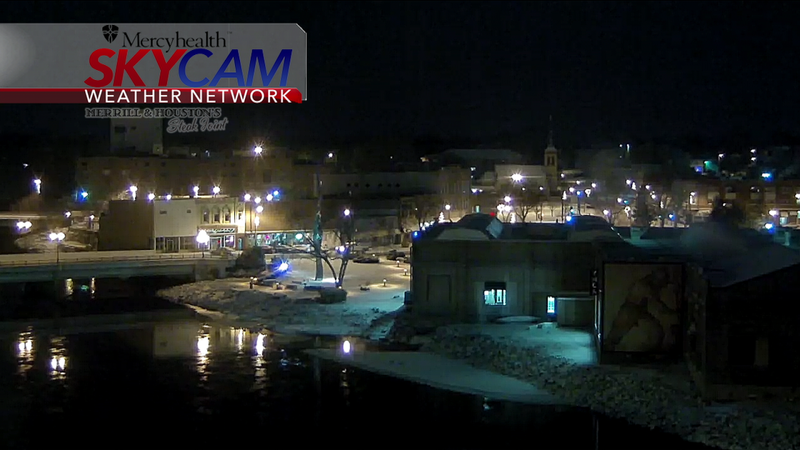 Winds will remain light today, so blowing snow won't be a concern. 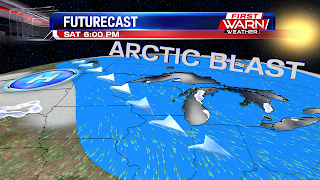 However, winds pick up out of the northwest early Saturday, and some blowing snow could be possible. After the snow today, the forecast into the New Year remains dry but very cold with another arctic air mass taking aim across most of the area. 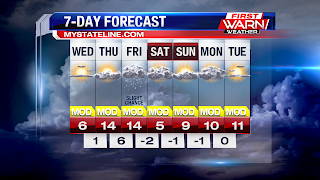 Highs for much of next week will remain in the single digits, with overnight lows dropping well below zero. 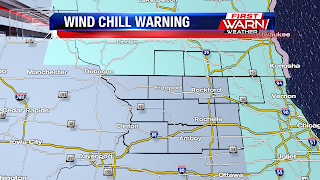 Its possible to have wind chills Monday and Tuesday morning near -20° to -30°! 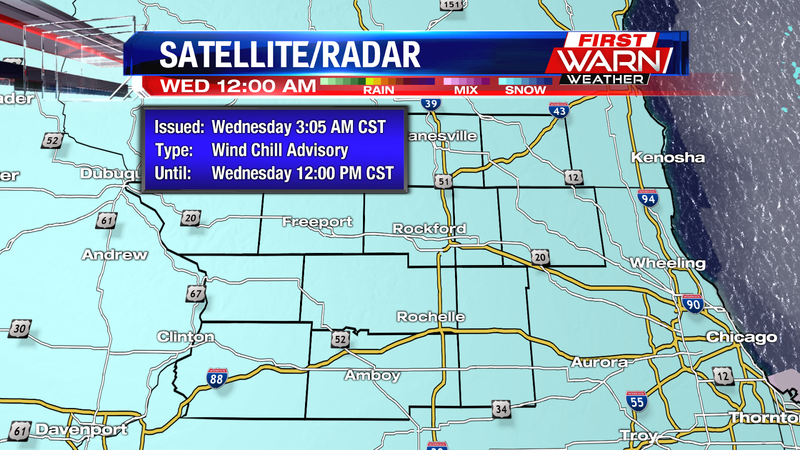 Wind Chill Advisories and Warnings will be possible. Make sure to stay tuned for updates! We got the full winter experience today with cold temperatures and snow lasting most of the afternoon. This put us in the Winter Wonderland, and we're looking to repeat that pretty soon. 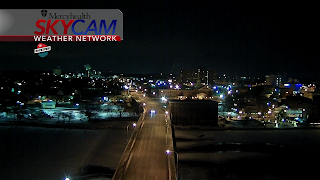 A few flurries are expected overnight, but we'll be seeing a bit more than flurries by tomorrow. By the time we get to around 9am we'll start to see some snow move into our area, this being part of a system that'll move in from out west. 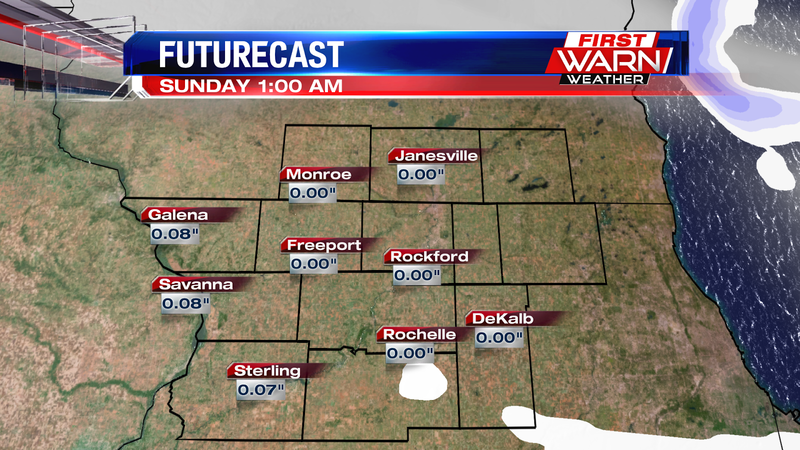 It'll bring a warm front into central Illinois, which will generate instability and allow for the snowfall to occur. Once we get towards the middle of the day we'll start to see that snow pick up a little more, allowing for snow showers similar to what we saw during the afternoon today. This will continue on for the rest of the day, not moving out of our area until we reach the overnight tomorrow night around 3am. As far as accumulations are concerned, the bulk of the snow from this system will fall in west central Illinois and over in Iowa, but we'll still see a decent amount. 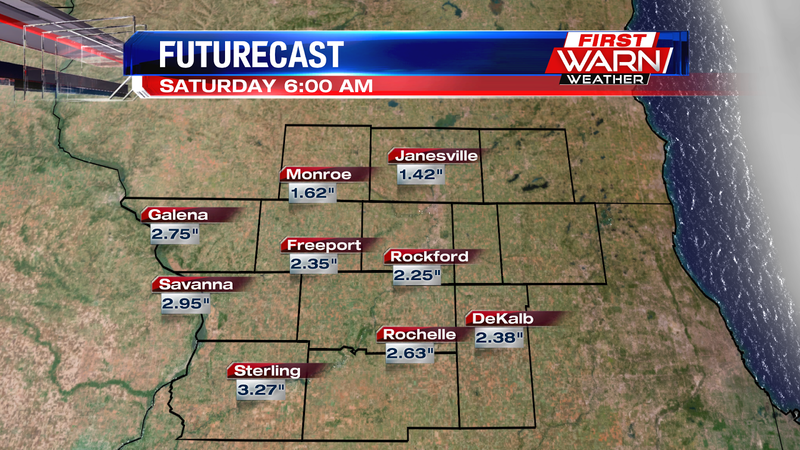 However, keep in mind that these are total accumulations, as in from 9am tomorrow to 3am Saturday. Thus, by the afternoon, we may only have seen about 1.5 to 2 inches. Areas that are near the state line will see about 2 inches total by 3am Saturday, with the southern portion of our viewing area (southern Dekalb Co, Lee Co, and Whiteside Co) looking to see near that 2.5 inch mark by 3am Saturday. 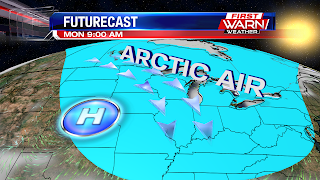 As we head into the weekend, another high pressure system will move into our area out of the northwest, which will continue the arctic air inflow into our area. This is expected to last through much of next week, keeping the air fairly dry and allowing for few snow chances. The only snow chances we have in the next few days will be Friday, and then towards the middle of next week when another system moves into our area. We can expect our high temperatures to mostly be in the single digits for the next several days, with most of if not all our overnights in the negatives. With temperatures this cold, wind chill will also play a big factor, so do be prepared to negative wind chill temperatures for the next several days. 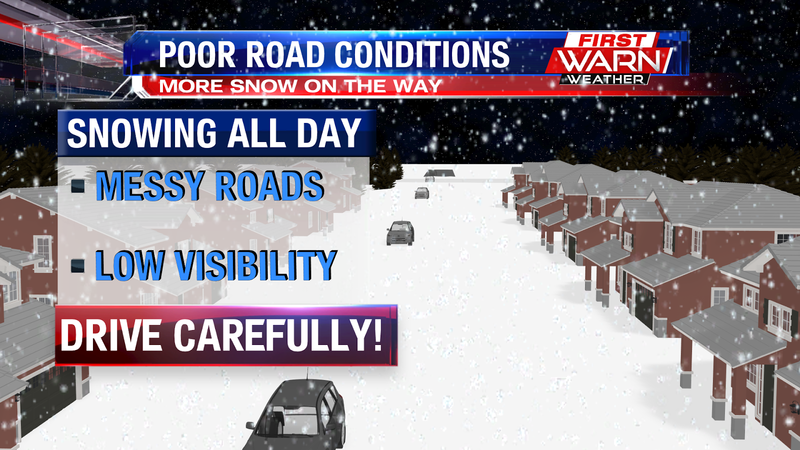 Another thing to keep in mind these next few days, regardless of snow accumulation, is that even light amounts of snow can allow for poor road conditions. Also, with how frigid the temperatures are, small amounts of snow can still allow for ice buildup on the streets, so be cautious when driving, ESPECIALLY at night, as black ice will will play a factor as well. Our weather has taken a decided turn toward with great timing - right on Christmas eve with enough snow to provide a White Christmas. Then the temperatures dropped! 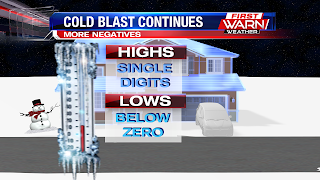 Our low this morning was a bone-chilling 9 degrees below zero and wind chills below -20. That trend will continue with a number of days in the 7 day forecast with lows below zero. It is that time of year! 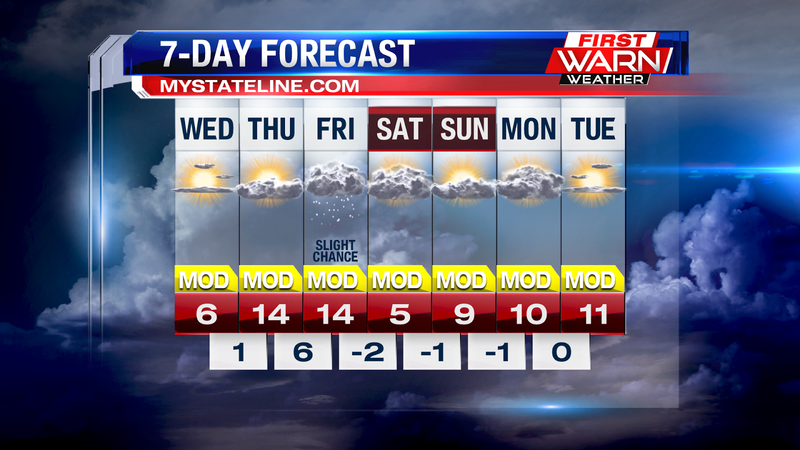 Along with the cold often comes the snow and it looks like we will get multiple chances over the next few days. 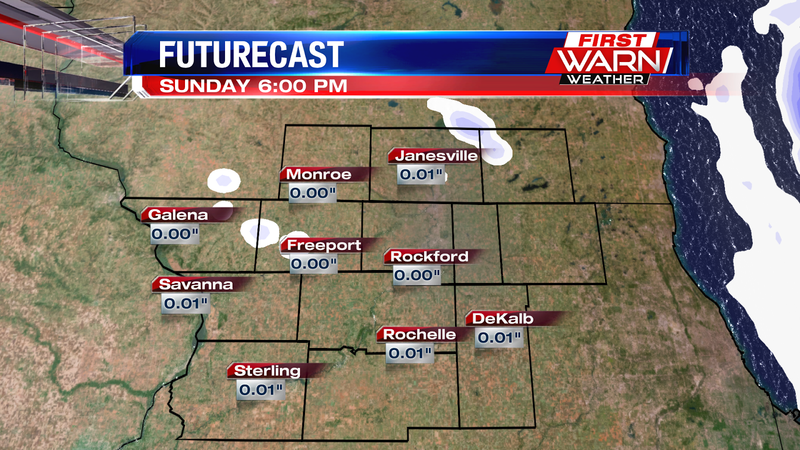 Tomorrow we will see scattered snow showers, mostly for areas to the North. Then on Friday it appears our Western and Southern counties will get into the act with a fast moving system that is scheduled to arrive Friday evening - right around rush hour. The snow will be on the light side from both storms - with a couple of inches possible, but it will be enough to provide a fresh coat of white! 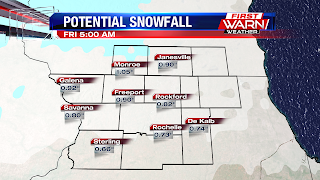 Snow falling across the Stateline Thursday morning, will likely cause headaches for some during the morning commute. Snow looks to move in between 6am to 8am from the west and head east across northern Illinois and southern Wisconsin Thursday morning. 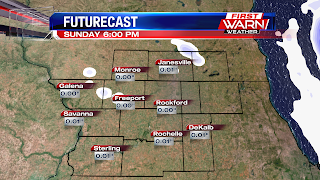 Minor snow accumulations are likely across the area through the afternoon, but this will cause slick roads across the Stateline. 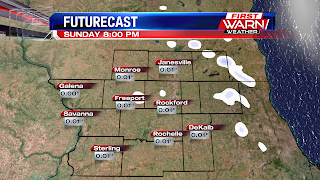 Right now looks like an inch or just a touch more will be possible along the Wisconsin state line, and then snow totals taper off as you head south of Rockford. While this won't be a major snow, it will still cause slick roads through Thursday. So, you'll want to take it slow as you head out the door, and of course leave more space between you and other drivers. There are small chances of snow possible again Friday and then again early Sunday, but the bigger story will once again be the arctic cold air as we ring in the New Year this weekend. 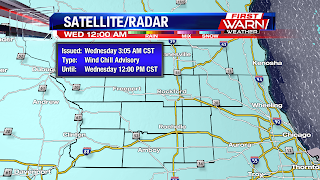 It's another bitter cold morning across the Stateline, with a Wind Chill Advisory in place across all of northern Illinois and southern Wisconsin. 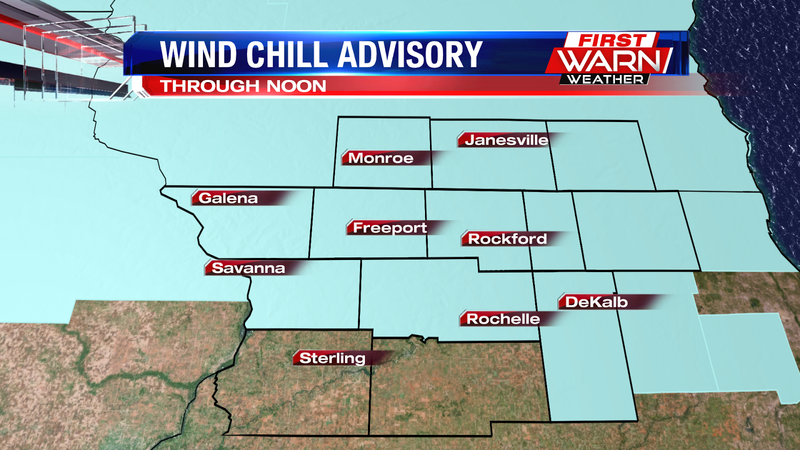 It continues through noon for Stephenson county, Whiteside, Carroll, and Jo Daviess counties. 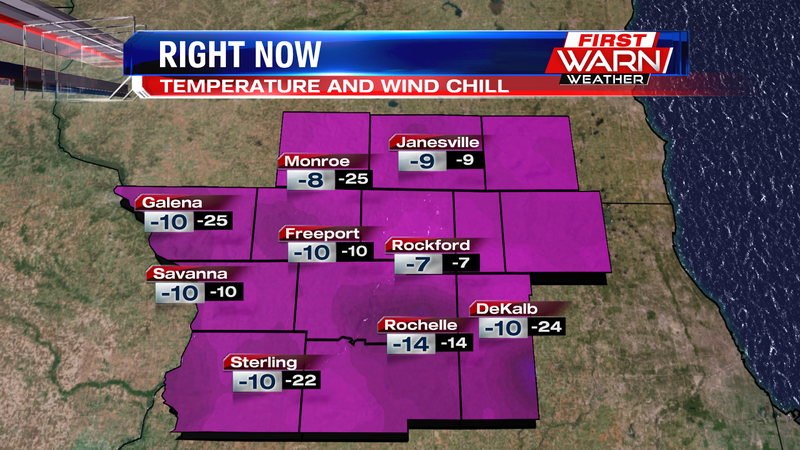 It expires at 11am for Winnebago, Boone, McHenry, Ogle, Lee, DeKalb, Rock, Green, and Walworth counties. 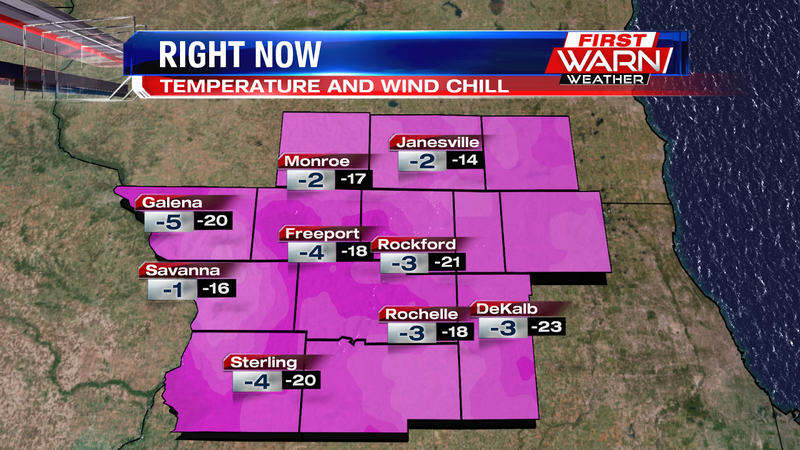 Actual temperature readings this morning recorded between -5° to -14° and chills have fallen as low as -25°. 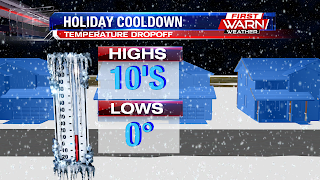 Even with abundant sunshine, temperatures won't climb much, highs only reach the single digits. The reason for the cold? Arctic air being brought in due to an arctic high pressure is one. But also very dry air, clear skies, and the recent snow pack are all causes of the extreme cold. When it gets this cold, frostbite and hypothermia can happen in minutes. Uncovered skin and your hands and feet are all more susceptible to frostbite. Hypothermia occurs when the body loses heat faster than it can produce. That's why its always important to bundle up and dress in layers when it gets this cold. Make sure you are watching out for your four-legged friends as well, and make sure you are not leaving them outside for extended periods of time. 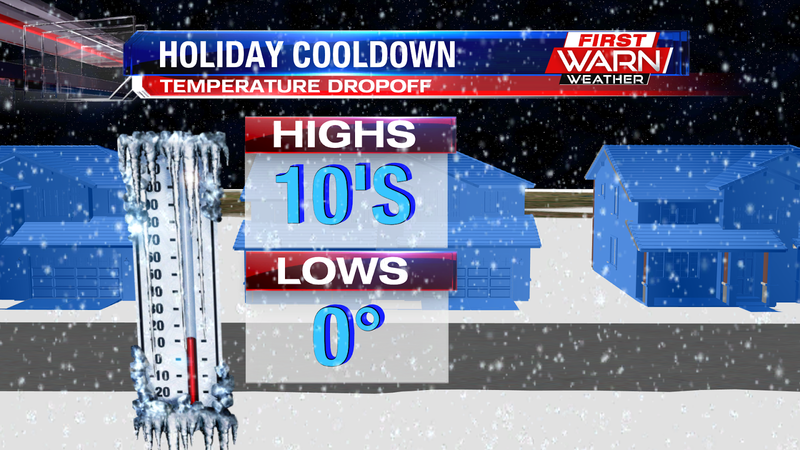 dropping below zero as we ring in the New Year. After a very cold turn in our weather just before Christmas, our primary focus has been on temperatures. We bottomed-out at -4 degrees this morning and will likely fall below that this evening with a predicted low of -7 degrees and wind chills between -20 and -30! 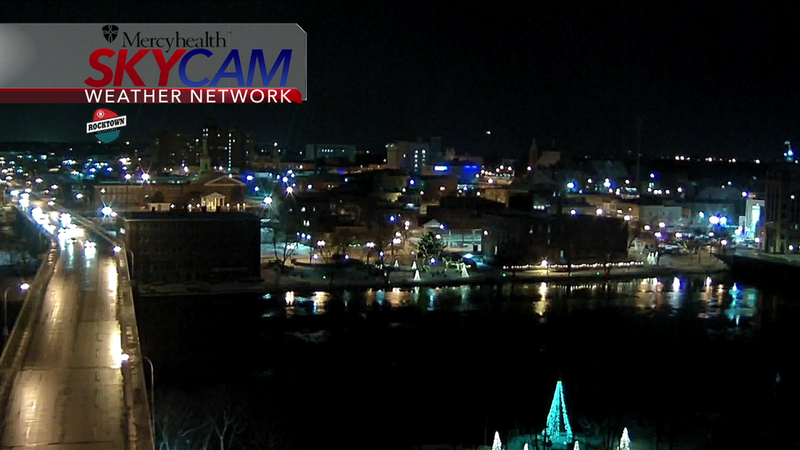 A last minute storm on Christmas Eve also provided a light snow cover just in time for our holiday. It looks like our next chance of snow will come on Thursday as a disturbance approaches from our west. Base on our last model run, it looks like the snow will arrive between 6 and 8 am on Thursday and stay with us until mid-afternoon - not great timing for the drive to work or if you have other plans during the day. This will not be a huge snow-maker but could lay down 1-2" of new snow in the Stateline area. Looks like Winter has finally arrived! 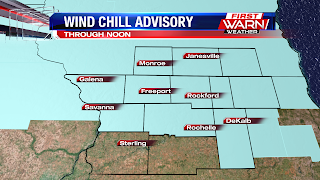 You'll need to layer up over the next several days, with a Wind Chill Advisory in place for most of the Stateline area through noon Tuesday. Though I wouldn't be surprised for another advisory to be issued for tonight or tomorrow morning. 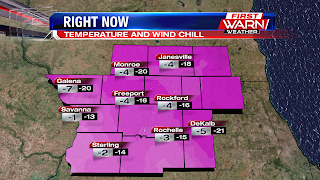 Morning temperatures for both Tuesday and Wednesday will be near -3° to -6°, and wind chills will drop to -20°. Abundant sunshine the next couple of days won't do much to help high temperatures. 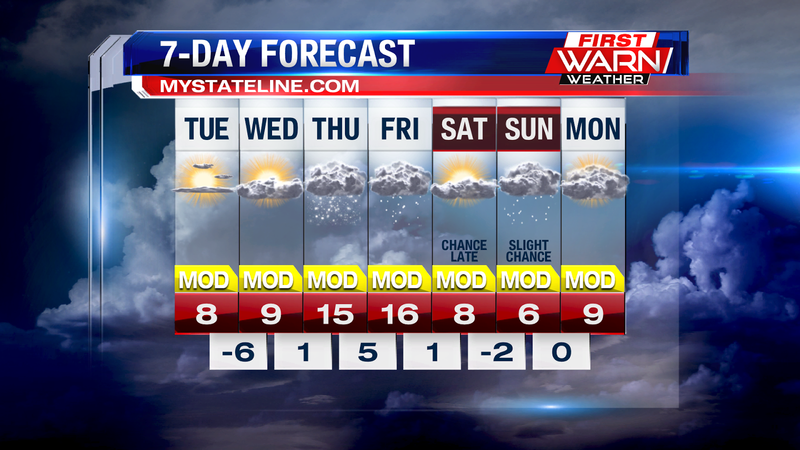 Both Tuesday and Wednesday will notice highs only making it into the single digits. 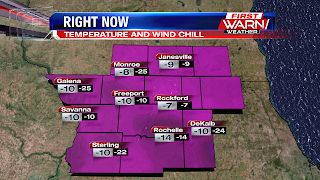 And with a westerly breeze today, wind chills will be stuck near -10° in the afternoon. Wednesday will also have chills below zero through out the afternoon, though winds will be lighter with high pressure arriving. When it gets this cold, frost bite can begin in 20 to 40 minutes. You'll want to make sure you don't have any exposed skin. You'll want to dress in layers to help insulate your body heat, and limit your time outside. 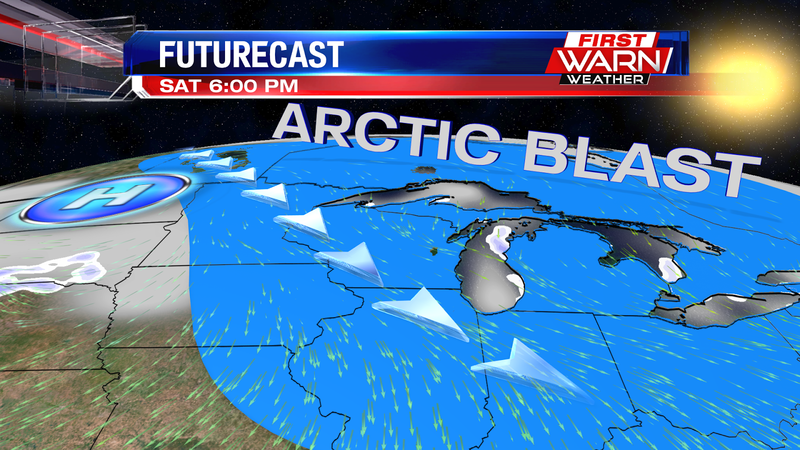 The arctic air mass continues through this week and into the start of the new year. 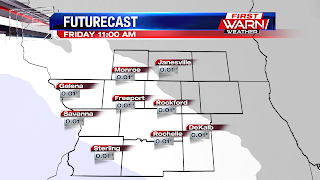 There will also be scattered chances for snow through the weekend. We got to experience a winter wonderland today as snow fell across the Stateline nearly throughout the entirety of Christmas Eve. It looks like those of us that wanted a white Christmas had our wishes come true! 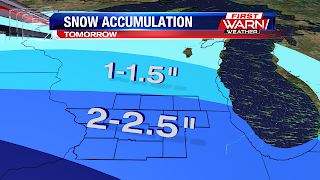 We do have a little more snow tonight, with some flurries as well. As we head through the evening we'll see a few clusters of light snow move through, but not to the degree of what we've been seeing throughout the day. By the time we reach 8pm we'll start to see more flurries than snow, as the low pressure system that brought the snow will start losing influence on our area. These will die down after 10pm, giving us a break until about 3am, when we can expect a few more flurries to move through. Those flurries will die down a little after 6am, leading to a clearing in the sky that'll allow for some sunshine during the late hours of Christmas morning. However, clouds will move in during the afternoon, limiting sunshine and keeping temperatures in the mid teens for the high. After Christmas we'll see a big dropoff in temperatures due to a high pressure system moving in from the north and pulling substantial amounts of cold air into our area. This is the pattern that we'll continue to see as we go through the week, allowing for temperatures to go through a few drops. This cooldown is going to allow for most of our highs this week to stay in the teens, with chances for highs in the single digits by the end of the week. 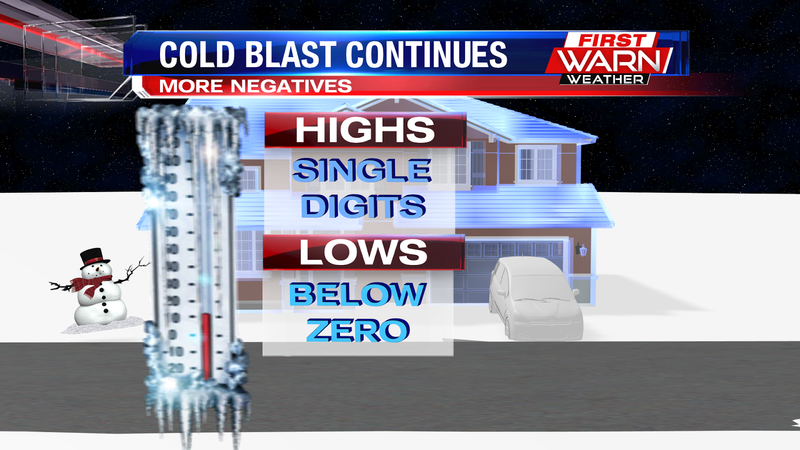 While most overnights will be around 0°, a few overnights will see temperatures dipping down into the negatives. Definitely get those heaters ready, because we're really gonna get a taste of winter weather this week! A cold start to the weekend with highs only getting into the mid 20's this afternoon, but we did get to see plenty of sunshine! Clouds will start building up after 9pm this evening, paving the way for the flurries we'll get overnight, and then the snow moving in tomorrow. The flurries will start moving in after midnight, scattering across the area by around 3am tonight. 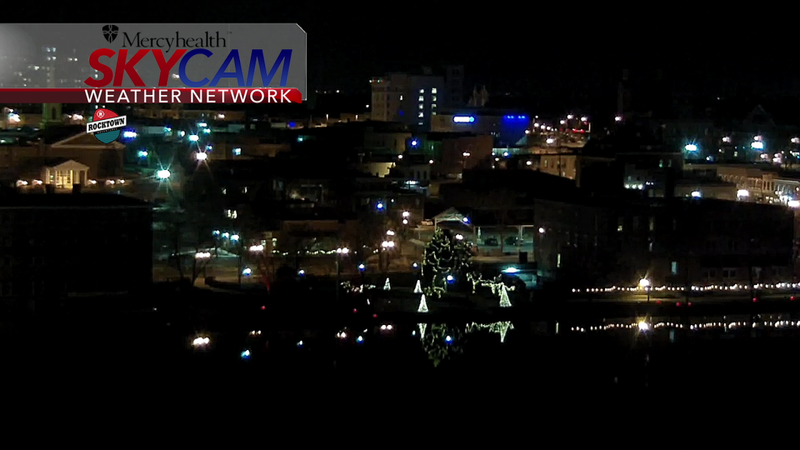 Even with the cloud cover in place, temperatures will still drop into the mid teens during the overnight. By the time we get to 6am, the snow will begin moving into our area, where can expect the heaviest snowfall during the morning and mid day. 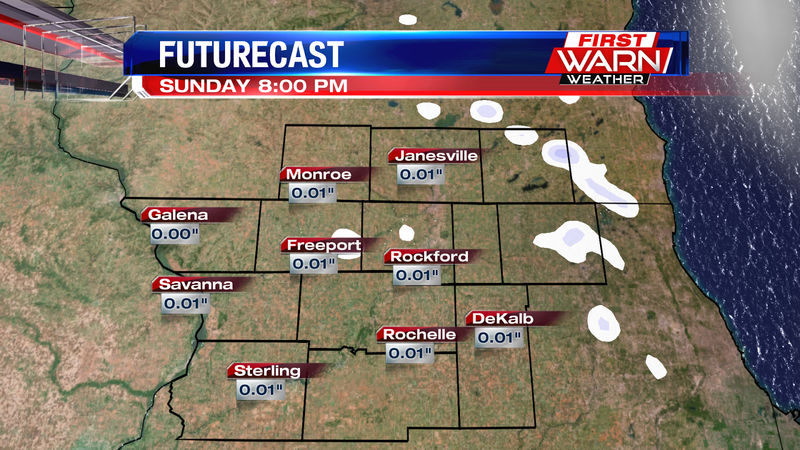 By 6pm the snow will die down to flurries, with everything clearing out by 9pm Sunday evening. The total amount of snowfall we can expect from 6am to 6pm is between 2.5 to 3 inches, with lesser totals up in central Wisconsin. The higher totals will spread from the Iowa and Missouri border to central Indiana, with these areas possibly seeing up to 4 inches. 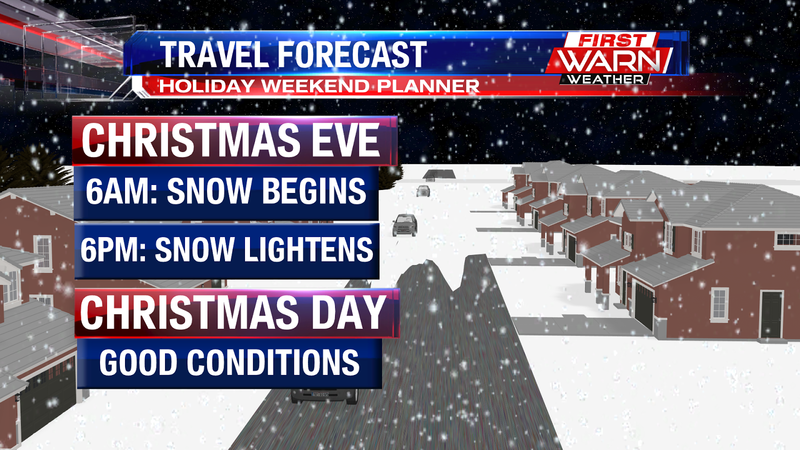 If you plan to travel during Christmas Eve you'll want to leave early as the snow is expected to stay with us the entire day. 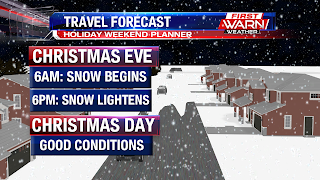 However, Christmas Day will have great travel conditions, as we're expected to stay dry after the snow moves out Christmas Eve around 9pm. As for the weather on Christmas, expect colder temperatures in the low 20's, but also expect some sunshine to brighten up your Christmas Spirit! After Christmas we'll see a big temperature drop, where we'll be stuck in the teens for the rest of the week, with a few overnights possibly dipping into the negatives. 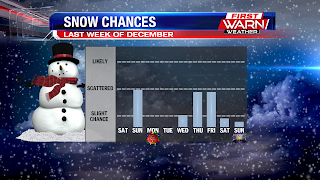 Our next show chance will be Wednesday night, with other snow chances on Thursday and Friday. 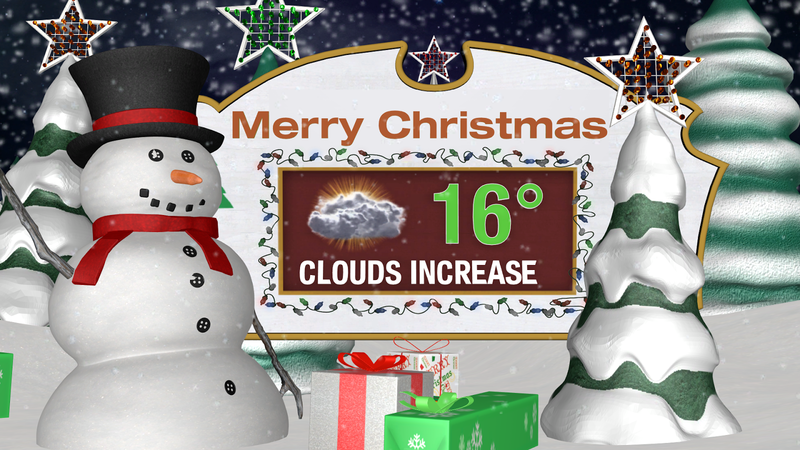 The countdown is underway to Christmas and it's possible there may just enough snow heading into the holiday to give it that 'special' feel. Models have been wobbling back and forth on a storm system expected to move through the Plains and Midwest late Saturday night and Sunday. The reason for the change has a lot to do with the storm system developing off shores of the British Columbia coast. But now, that system is beginning to move into the Pacific Northwest and there seems to be a little more consistency among our computer models for the potential for light snow early Sunday. 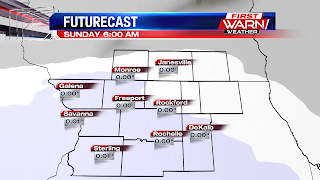 Latest model runs have pushed the storm system a bit further to the north, allowing the northern edge of snow band to move into northern Illinois during the first half of Sunday. Even with that northward shift, it appears as if accumulations would be light as the higher snow totals would most likely fall to the south. 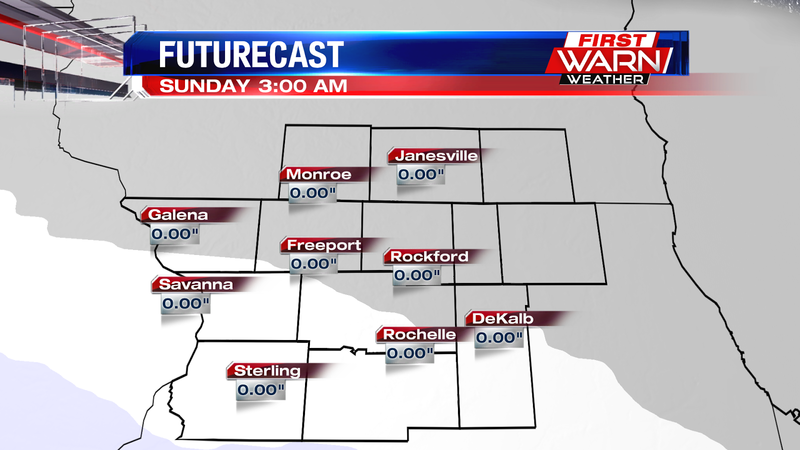 But if the northward shift continues, there could be a couple inches of snow on the ground by Sunday afternoon. Keep in mind, though, that there is also the chance for the system to shift further to the south which would most likely leave us with only a few flurries during the day. Either way, I do think there will be a little snow that does fall on Sunday. It's just a matter of whether or not it'll be enough to shovel or just to brush off the front step. 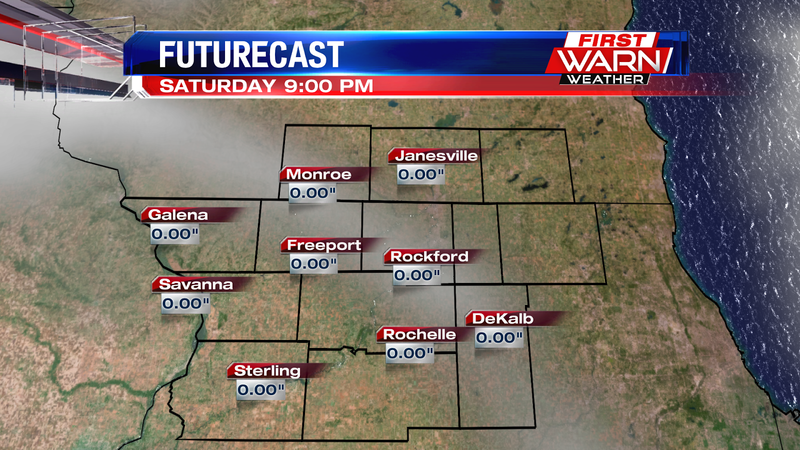 The atmosphere dries out quite a bit for Saturday, but becomes very saturated by Sunday morning. The most favorable region in the atmosphere for snow development Sunday will be fairly deep from the surface to the mid level of the atmosphere. And this is why even if the strongest part of the jet stream doesn't move nearby, I still think we may have a few flurries/light snow showers during the day. It's a busy holiday weekend and it's best to keep tabs on the forecast. There will most likely be many who will be finishing up last minute shopping or heading out to other events and church services. After Sunday, there does appear to be at least a couple more chances for snow before we head into the new year. Let It Snow.....Let It Snow!